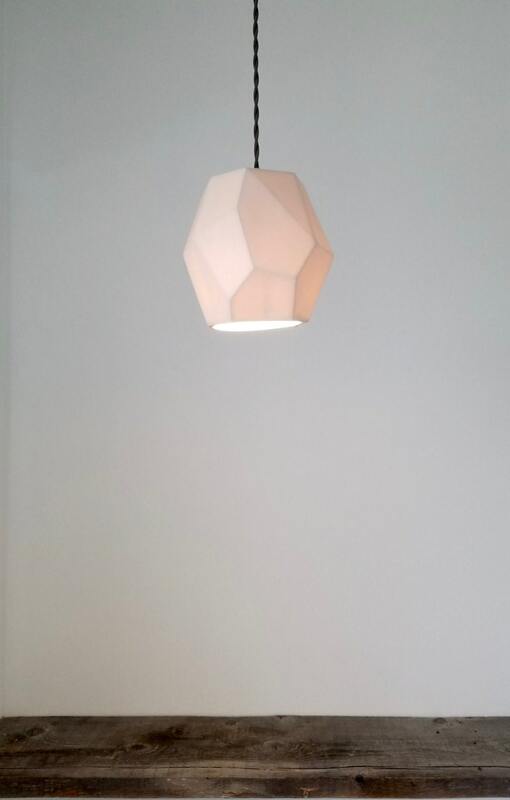 Our translucent porcelain ceramic provides a soft, diffused glow. 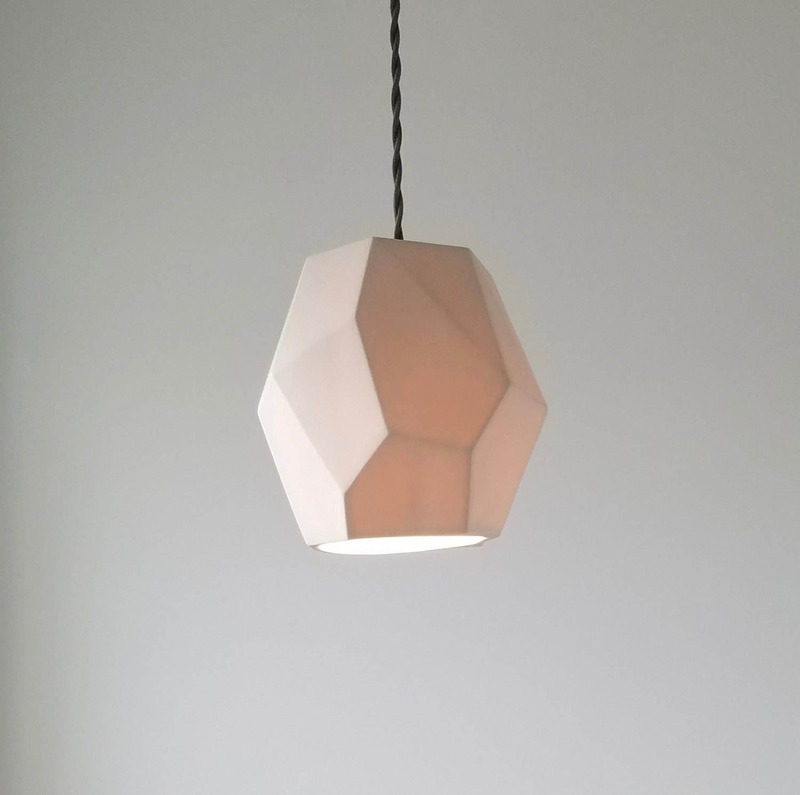 Great for ambient lighting or a more focused light directly under the pendant. 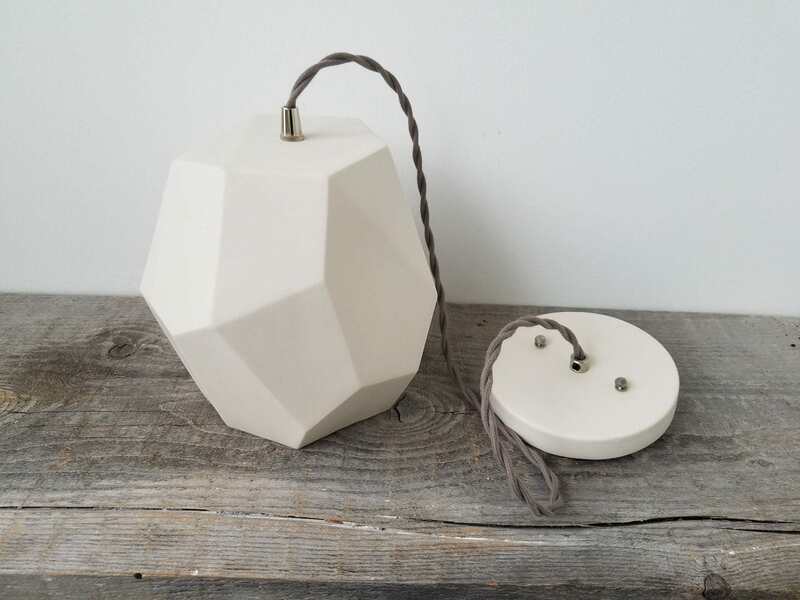 This uniquely handmade porcelain pendant light holds a single standard (medium) size light bulb. 100 watt MAX. It is compatible with incandescent, LED and compact florescent bulbs. Measures approximately 8'' high and 8'' wide. The cord is adjustable up to 36'' long. Single porcelain socket. All mounting hardware is included. We use only high quality parts. 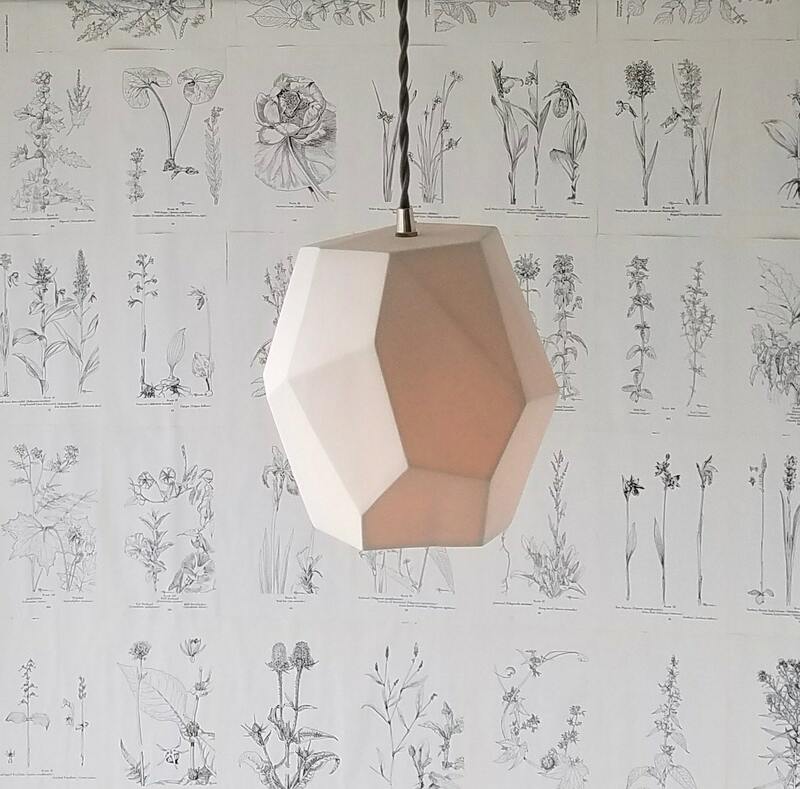 Porcelain canopy matches the material of the pendant. 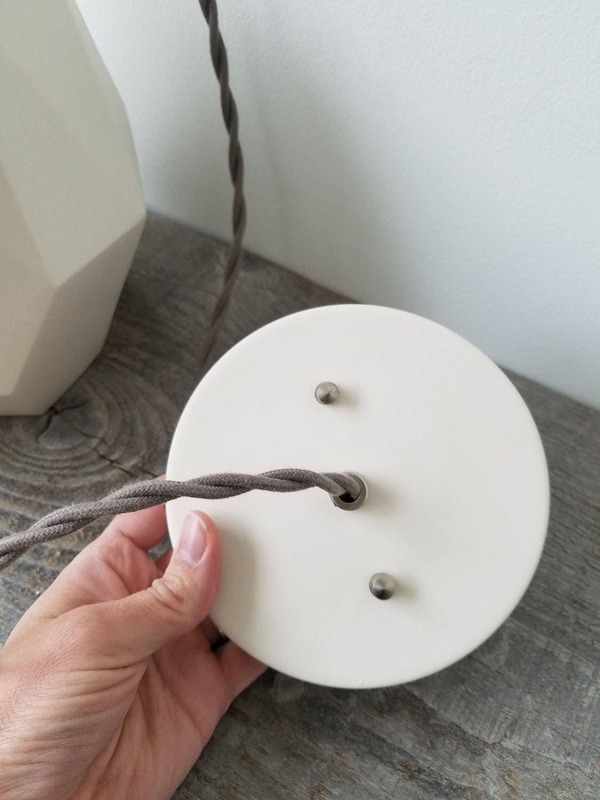 The cord is a light colored gray and matches with any other colors in the room. Plug-in with on/off Switch: 10 ft. Cord Length on/off switch located 36'' from plug. Made to order: Please allow 10 business days for shipment. If you are in a rush, please contact us. We accept both credit card payments and Paypal. We currently ship twice a week--Mondays and Thursdays. If these days fall on a holiday, your order will go out on the following business day. You will be notified via email when your order ships. The shipping method is listed in each listing. Please view the details of each service below. -USPS First Class: (5-7 days) This is the least expensive method for domestic shipping. Delivery Confirmation IS included in this price. Insurance is NOT available with this service. -Priority Mail: (2-3 days) Delivery Confirmation IS included in this price. Insurance up to $100 automatically included in this price. -FedEx: (varies by location) This service automatically includes tracking and insurance. In the result of a claim, it is the BUYERS responsibility to file with FedEx. Delivery Confirmation: You will be able to see when the package departs the post office and when it is delivered to it's destination. This number will be emailed to you when your package ships. Insurance: Protects against loss or damage. It is the buyers responsibility to request insurance on the parcel. Please contact us to add this service prior to purchase. In the case insurance is not purchased, Revisions is not responsible for lost shipments. -USPS First Class International: (varies by location) This is by far the least expensive way to ship internationally. Unfortunately TRACKING & INSURANCE are NOT available with this service. We are not responsible for lost packages that are sent via this service. -USPS Priority Mail: (varies by location, faster than First Class) INSURANCE is available but is NOT automatically included in this service. It is the buyers responsibility to request insurance on the parcel. Please contact us prior to purchase. Revisions is not responsible for lost packages that are uninsured. -USPS Express Mail: (calculated guaranteed date or your money back) This service DOES AUTOMATICALLY include tracking and insurance. If your purchase is valuable, we suggest you upgrade to this service. As with all international purchases, any duty fees or customs fees imposed by the destination country are the sole responsibility of the buyer. Every country charges it's own rate and it is the buyers responsibility to be familiar with the charge they will receive in duty fees before purchasing. The price you pay for shipping covers just that, shipping. No duty fees are included in that price nor will we falsify customs forms to evade any liability upon entering the buyers country. Sorry, but we cannot offer refunds or exchanges for custom orders at this time. 1. Shipping charges are non-refundable in the event of a refund or exchange. The customer is responsible for ALL shipping costs associated with the exchanging or returning of products. Refunds or exchanges must be done within two weeks of receiving the order. 2. A 10% restocking fee will be deducted from your refund in the event of a return. Exchanges will not be charged a restocking fee. 3. Products that have been used/worn are not refundable. Wholesale rates are available. Order minimums will apply. Please contact us at: info [!at] revisionsdesignstudio.com for more information.